The Occupation is a campaign designed to promote the occupation of ideas and spaces by women. In chapter 3, Priyanka Sutaria talks about how travelling solo as women is a journey within and without. I love being outside. I don’t remember when this love affair started, but I do remember a time when I hated going out. A homebody, I buried my nose in book after book, ignoring not only the reality of what was around me, but even that which lay beyond my front door. This was when I was a child, before my measured existence as a woman began. When I was a child, I was not taught ‘how to be a girl’ beyond the usual instructions to never sit with my legs apart, or the (genuinely weird, in retrospect) murmurs about how my father needed to start saving for my marriage. But as I grew up I learnt that it isn’t so easy when a girl grows into ‘woman’, for she has to allow for the skin of her girlhood to moult; she no longer has the luxury of simply being. In my case, a hilarious anti-climax of sorts, the more I shed the skin of my girlhood, the less ‘woman’ I became. I do not think my extended family was prepared for my becoming, or my woman, because she sits with her legs apart. She is probably not going to be get married. This woman and her father chuckle over midnight coffee at all the family members who bide their time in the hope that one day, I will become ‘woman’. Most important of all though, is that my woman is no longer indifferent towards the outside. She likes occupying space. When Ishita first took off on her solo trip, she was worried about what might happen. In the end, she emerged empowered and able. I think being outside is just about my favourite rebellion against ‘woman’ now; I usually do it at night and by myself—my own private reclamation of time I did not know I could occupy, a quiet existence in space I was always too hesitant to acknowledge. At least, not without measuring myself against standards of gender imbalance. It is exciting, this newfound love—of being, of the outside, past hours titled decent, eschewing the title of decency myself. And yet, despite this urge to break the rules of what it means to be ‘woman’, I have not travelled much, and I certainly have never travelled solo. I often gaze enviously (and proudly!) at the solo exploits of women around me. 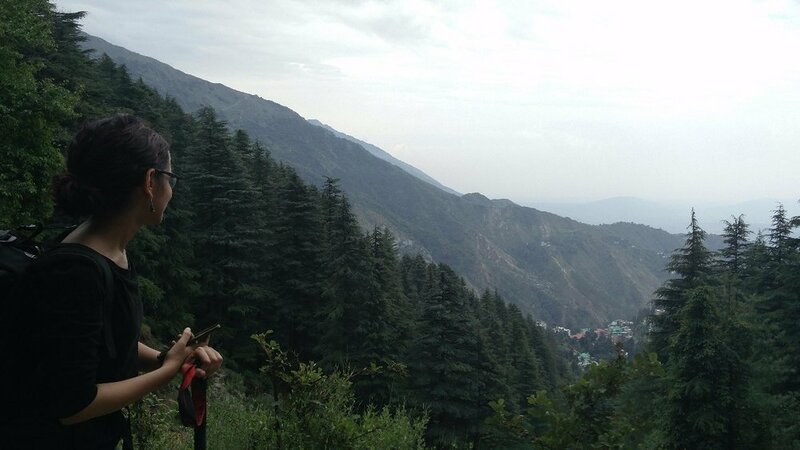 A lot of people call Antara "brave" for travelling solo, but for her it is just something that happened to be, rather than something she does to prove a point. Hearing these women talk, it seems to me that if women are told enough times that something will go wrong, they are bound to be conditioned into truly believing it. When it is proved otherwise, however, they emerge empowered—from bathrooms, from tapris (ever heard of Girls at Dhabas? ), from entire excursions made in solitude. And simply by listening, I feel the seams of my conditioning unravelling; the little girl in me who avoided to outside to find solitude within four walls starts to realise that solitude has nothing to do with where you are and everything to do with who you are. When women are taught to be ‘women’, they are also taught to be afraid, especially of the outside world. In a patriarchal world, a woman’s body (and therefore, by extension, her thoughts) are governed constantly by safety. The measured existence often interrupts solo excursions when concerns about one’s physical wellbeing weigh heavily on a woman’s mind as she steps outside. Sahana Rao (22) says that when she first set out, she was not entirely prepared for this reality. “I definitely was not equipped to deal with it; I hadn't thought of safety; I didn't carry my pepper spray…” Learning from past mistakes, she carried her pepper spray to Delhi when she went there recently: “I still got molested though.” Safety is also the reason travel writer Supriya Sehgal crowdsourced this handy list of safe cabbies across the country. "You're just a piece of meat in their eyes. But none of this deters me from wanting to travel again," says Sahana determinedly, despite facing sexual violence multiple times on her trips. Most of the women I interviewed bring up the exhaustion caused when the desire to travel alone clashes with the culture which they are ‘questioning’ when they express this desire. From concerns raised by family to unsolicited advice to having to constantly be acutely aware of their surroundings and not let loose even if they wish to do so—these women have faced it all. They speak about the annoyance with having to dress a certain way and not do certain things in certain places, because people are “ready to pass moral judgements”, as Sahana puts it. Many people label Amla's solo travels as either brave or stupid. For her, it is just being an independent adult who is taking a holiday because they can and wish to. What most women want is to learn; learn about the world and all it has to offer. They are often shut down, or have no role models when it comes to this task of learning. But through speaking to just these few women, I have learnt (and unlearnt!) what it means to be a woman who does not let that hold her back. Now, when I am outside, when I am travelling, when I am alone and walking around in clothes I want to wear, doing things I love doing (reading books and getting out of my house), I am doing it with the hope of little girls watching me. I hope they are looking, and I hope that just my very existence on the outside, with complete agency and in absolute control of my own actions and choices, will encourage just one little girl to do so as well. I wear this both as a responsibility, and as a badge of honour; nothing matters more to little girls than representation. And representation doesn’t always come on TV screens and in books—both usually inside stuff anyway. It comes from women who break barriers and stereotypes just by doing what they love. They are here to represent us, girls and women, and so am I. We are here to just be, to just become, to be women and not ‘women’. Too much time has been wasted sitting inside; I (along with my books) are off on an adventure. Newer PostAsk a Feminist | Q. 1 Why do some feminists hate men?